Supports 11 command line encoders : ffmpeg, mencoder, ffmpeg2theora, x264, xvid_encraw, avs2avi, lame, faac, Nero AAC, OggEnc and WavPack. More will be added later. Batch processing. Parallel processing (multiple files can be transcoded at same time). Advanced configuration options for all codecs. Supports 2-pass encoding with automated first pass. Encode video using vfw codecs such as VP6, VP7 and FFDShow (by using avs2avi). MeGUI presets can be imported for x264 and xvid encoding. Input files can be avisynth scripts or any format supported by ffmpeg. For encoders such as x264_cli which support very few input formats, the video is decoded with ffmpeg and then piped to the encoder, on-the-fly. 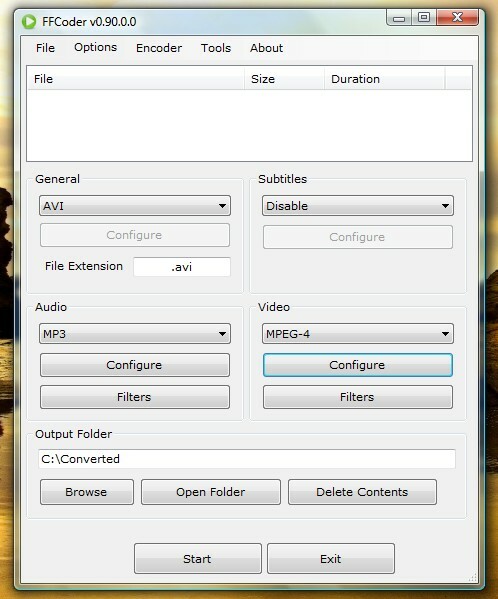 Tools – dump audio/video stream to file, create thumbnails/images in JPEG/BMP/PNG/TIFF format, rebuild file, etc.